There’s a bumper crop of blooms at Heronswood right now. From daisies to dahlias, geraniums to gingers, our flower borders are hopping! But while they gladden our hearts, flowers don’t put on this show for our benefit. They hope to attract bees, butterflies and hummingbirds, who transfer pollen between the flowers, enabling fertilization and seed production. Bright colours and heady scents serve to entice pollinators, while rewards of pollen and nectar ensure they keep coming back. Specific colors attract specific pollinators. Red blooms are always popular with hummingbirds, but these feisty birds will visit flowers of other colors, while bees and butterflies attend flowers of many different shades. 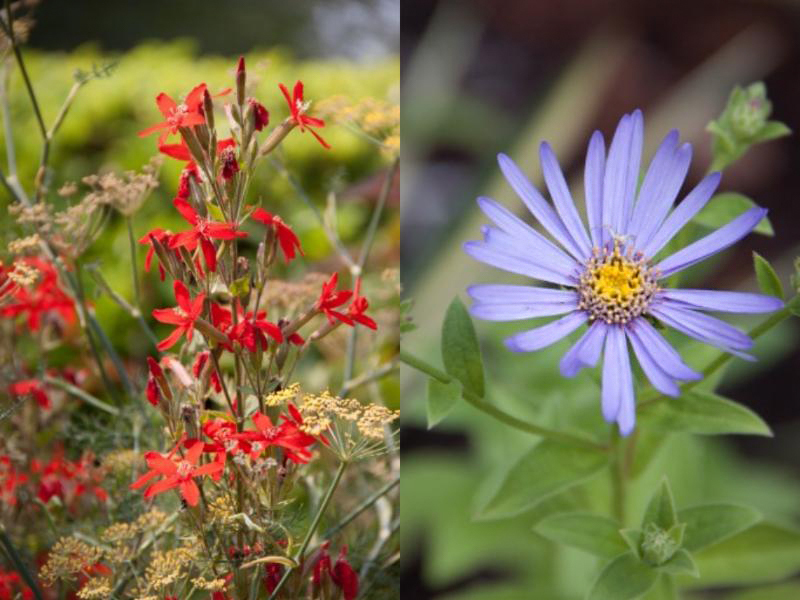 In the Potager, the tubular flowers of blue cardinal flower (Lobelia siphilitica) and royal catchfly (Silene regia “Prairie Fire”) are popular with hummingbirds. In each flower, the petals are partially fused together, forming a tube. To retrieve the nectar, birds must probe the flowers with their beaks, brushing past the pollen-loaded stamens. By collecting a cargo of pollen, hummingbirds earn their nectar, but there are cheaters about! Bumblebees don’t have a long beak and cannot reach the nectar, but some pierce the petal tube to claim the reward, without carrying any pollen. Unlike many hummingbird flowers, asters offer their nectar to a wide range of pollinators. Ours are buzzing with honeybees, bumblebees, hoverflies and butterflies, but it’s the skippers that are especially conspicuous right now. These small orange butterflies rise up in clouds whenever you approach them. 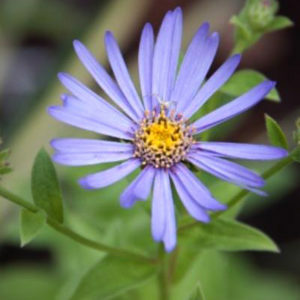 Most garden asters have now been transferred into the genus Symphyotrichum [thanks taxonomists!] but whatever they’re called, they make great garden plants. Blooming from later summer through fall, they come in a wide range of colors, are low maintenance and the flowers last well, both in the garden and in a vase. At Heronswood, they’re blooming now in the Potager and Perennial Borders, and many places in between. Come visit and see how many asters you can spot.